"Damage was extensive along the entire path of the tornado. At least 20 homes were destroyed, 36 homes sustained major damage, 157 homes had minor damage, 9 mobile homes were destroyed, 8 businesses were destroyed, and numerous vehicles were destroyed." 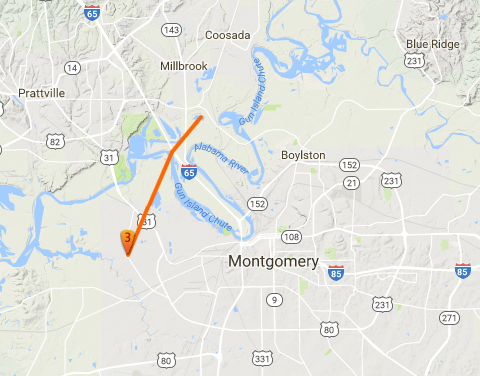 The map below from TornadoHistoryProject.com shows the path of the Montgomery tornado. 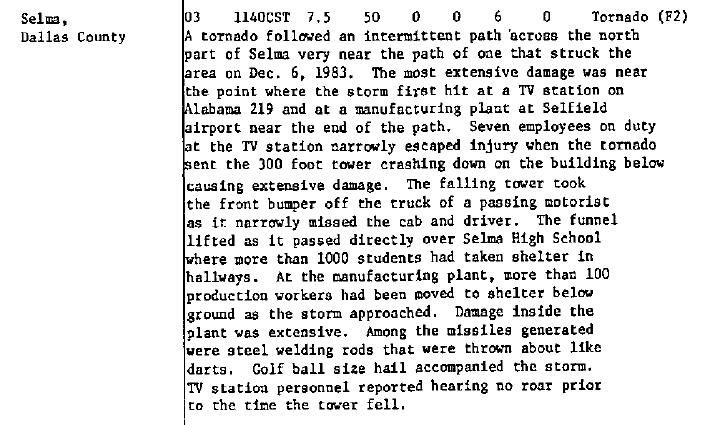 "More tornadoes struck that afternoon, with a funnel cloud even passing over the station. The power went out but the broadcast continued with an emergency generator, one camera and a light. 'We went wall to wall (continuous coverage),' he said. 'I was 28 years old, and it was a trial by fire!' The station general manager was so impressed with his coverage that day he gave him $100." "Alabama Gov. George Wallace declared a state of emergency and asked President Reagan to declare the state a disaster area. A trucker whose 18-wheeler was blown away in the funnel cloud that set down on the four-lane Northern Bypass highway in Montgomery said the twister tore out the seat of his pants. 'I don't know whether I was blown away from the truck or whether the truck was blown away from me. It was a mess,' said Amos Garmon. 'The seat of my britches was out. It just about tore my clothes off." Police officers used long sticks probed the swampy area next to the road, trying to determine if bodies were thrown into the morass, but by late Thursday night none had been found. Spokesmen said 17 people were taken to Baptist Medical Center in Montgomery and 13 to Jackson Hospital. 'The injuries range from lacerations and bumps and bruises to very serious injuries,' said Baptist spokesman Gene Hannah. 'We've got three patients in surgery. We've got one patient who had a coronary.' Ronald Jackson, 21, said he was driving down Northern Bypass when 'the wind picked up and things started blowing around. Juts before we pulled over I saw it coming from the southwest. I was scared as hell. Jackson, who suffered contusions and lacerations, said his car was 'turned over in the ditch and picked up and dropped again.' 'I was screaming 'Make it stop'' he said. He said he saw cars 'in trees and in ditches' after the tornado passed." 12:30 a.m. SW Limestone F1 A tornado struck near Clements High School and moved NE. One barn was destroyed, a home unroofed, and at least 100 trees were downed. Two homes were damaged and trees were knocked down. Several mobile homes were damaged and many trees were blown down. Tornado briefly touched down and uprooted some trees. Most of the damage was confined to downed trees. Several structures were damaged or destroyed along the path. Numerous trees were blown down. 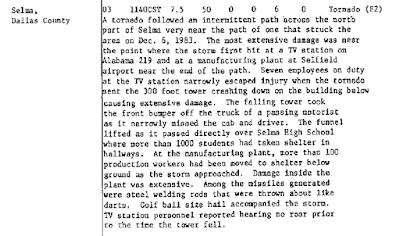 A 300 foot TV tower was leveled and it caused extensive damage to the building below. One manufacturing plant was heavily damaged. A small tornado briefly touched down in an open field with little or no damage. 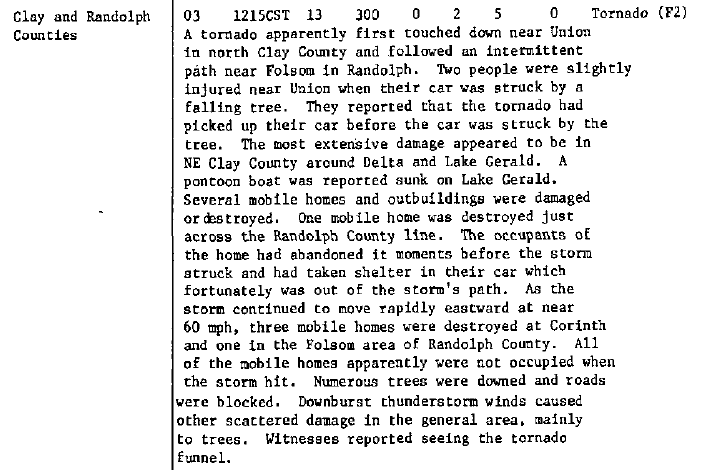 Several mobile homes or outbuildings were damaged or destroyed along the path. Some homes sustained roof damage, one mobile home was destroyed, and many trees were blown down. One barn was destroyed and one home damaged at Morrisons Crossroads. Outbuildings were damaged at Newell. Several trees downed in the Pine Hill Community. 3 barns and 2 chicken houses were destroyed. 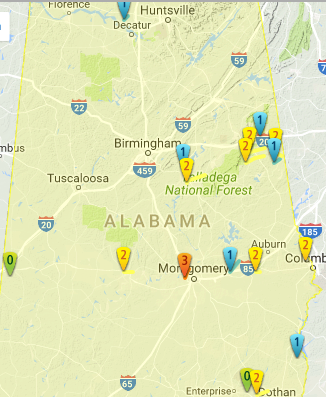 10 other homes sustained roof damage and numerous trees were downed. A 30K gallon tank was pulled off its foundation and moved 10 ft. 3 buildings were destroyed, 4 homes were damaged, and numerous trees were downed. A grocery store, a restaurant, a hardware store, a several mobile homes were destroyed. One person was injured in a mobile home. Hundreds of trees were downed. 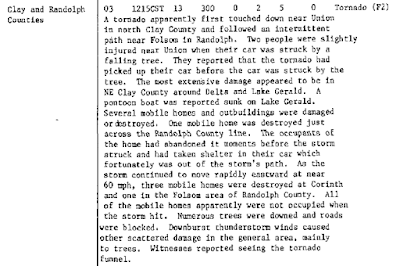 Numerous other severe reports can be found in NOAA NESDIS Storm Data Publication for May 1984.